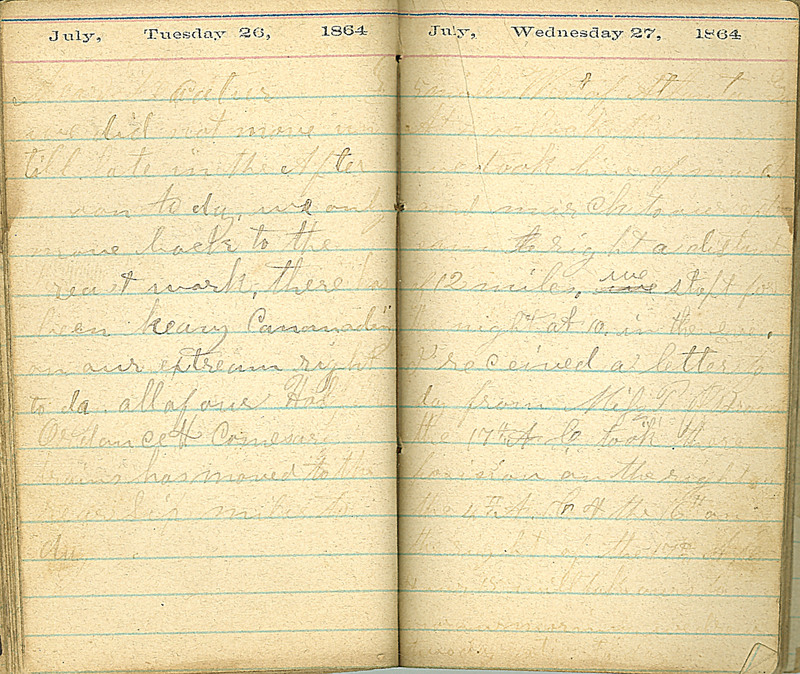 July, Tuesday 26, 1864 Near Decatur Ga. we did not move un till late in the After noon to day, we only move back to the breast work, there has been heavy Canonading on our extream right to day. all of our [?] Ordance & Comesary trains has moved to the rear Six miles to day July, Wednesday 27, 1864 5 miles West of Atlanta Ga At 4 oclock this morning we took line of march and march to our extream right a distant of 12 miles. we stopt for the night at 10. in the eve. I received a letter to day from Miss P.J. Brown. the 17th,, A.C. took thare posision on the right of the 4th,, A.C. & the 16th on the right of the 17th,, [After Noon?] [?] will take [?